Things you NEVER want to hear in deep space… “It’s in my suit!” That’s what Dixon hears from Sinclair, his rookie crew member. Within a few pages there’s a huge blast and almost everyone is dead except Dixon, badass pilot Anna Cheron and a survivor from the original mining crew. Like Ripley in Aliens, survivors of a traumatic space explosion are put through the bureaucratic grind about what happened, including having to speak with special assistant for engineering operations and safety, Mike Taylor. We learn that one of the original crew went crazy and attacked Dixon’s rescue team. Dixon doesn’t believe he friend Bear (as large as his name would indicate) could be taken down by one psycho, and believes that “something hostile” had to do with the explosion. Cheron intimates the “something hostile” was the thing in Sinclair’s suit, rather a psychotic space miner. Of course, this all means they have to go back and check out the asteroid, this time Taylor is driving. 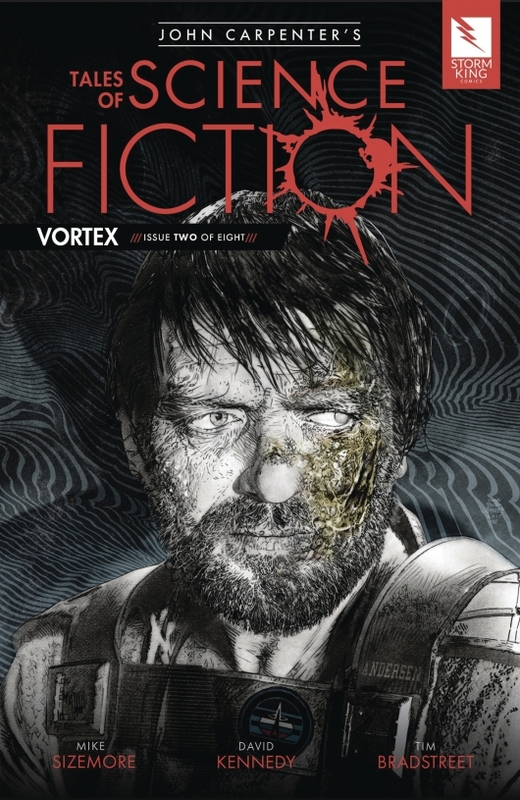 Vortex is moving along slowly, but that doesn’t mean boring. It’s an 8-episode story, so I appreciate Sizemore taking the time to give his characters depth. Dixon is a gruff captain confounded by a mysterious past and seeking revenge for his fallen crew. Cheron is a total badass, and I’m glad she survived the initial issue and I’ll be rooting for her going forward. What I really like is the foreboding sense of dread the permeates this issue. It is very reminiscent of Aliens and I feel soon we will see more of the monsters we only glimpsed in issue #1. Dave Kennedy’s artwork helps emphasize the tone as our main characters are often in tight quarters. And the final pages are fantastic, one image in particular is straight out of my nightmares, but I won’t spoil it. Vortex is moving along nicely and I cannot wait to see what lies ahead for these characters and what entities they encounter. 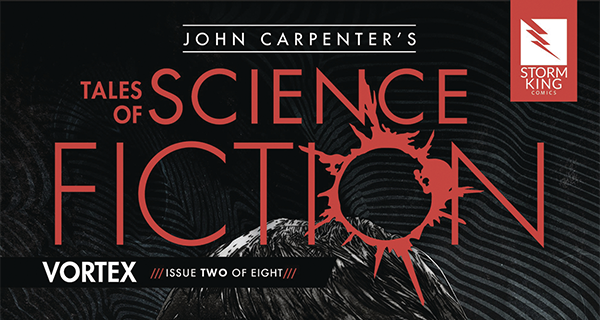 John Carpenter’s Tales of Science Fiction: Vortex #2 is available now in stores. Issue #3 comes out 12/27.